Little House on the Prairie: A TV Show for Adults-only? Little House of the Prairie debuted on NBC on September 11, 1974. 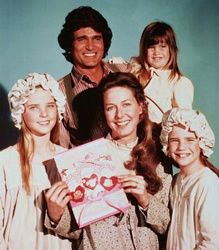 Based on the books of Laura Ingalls Wilder, the TV show centers around a hard-working frontier family; Charles (Michael Landon) and Caroline (Karen Grassle) Ingalls and their three girls — Mary (Melissa Sue Anderson), Laura (Melissa Gilbert), and Carrie (Sidney and Lindsay Greenbush). Other memorable characters include Doc Baker (Kevin Hagen), Reverend Alden (Dabbs Greer) and the Oleson family (Richard Bull, Scottie MacGregor, Alison Arngrim, and Jonathan Gilbert), owners of the local mercantile. The series has one of the most memorable series finales in TV history. After a developer swindles the townspeople out of their property, the residents decide to blow up their homes so he wouldn’t get them. Do you think the rating will hurt Little House DVD sales? Little House has been very popular in syndication for years and remains a mainstay on Hallmark, a cable channel centered around family programming. The series has also become very popular on DVD, in part because parents who grew up with the series remember it as a charming program that the whole family can enjoy. Overseas, things work a little differently. Little House is already popular in Finland and is shown regularly on the state-owned YLE so it’s hard to say how much of a negative impact the stickers will have on sales. Who knows? Maybe some adults will purchase the DVDs hoping to find racey material that they’d previously missed! Stay tuned! I watched Little House when it aired in 1974. I now watch it faithfully every time I can. It airs now on Hallmark and I watch it in the afternoons, and it also is on in the evenings.I’m not so crazy about the “New Beginnings” though. My favorite era is when Laura was really young. Michael Landon was one of my favorite actors, and I miss him still, as he, and Patrick Swayze were taken away from us too soon. but for those who don’t it must be a huge disappointment, Martha Stewart should be on the fine Living Chanel, or She and the other two new shows should be on different channels, Ihope there are enough of the LHOP Fans that agree, and boycott The Hallmark Channel and agre with Me!!!! NBC is the guilty one here. Rules must be obeyed. Everyone in Finland knows what kind of stuff this series is, but “not under 18”-limit comes automatically because NBC is the stupid one, too cheap to pay the fee.